As a freelance copywriter and editor who lives life on the clock, I’m always interested in better time management. 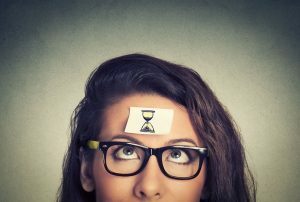 So I paid particular attention to a recent post from Patty Azzarello (@pattyazzarello) titled “Protect your time: And don’t feel guilty.” Aha, I said to myself, I bet there’s some good stuff here that I should share with my LinkedIn network. And I was right. In fact, I recommend reading her post yourself—it will take you about three minutes—and subscribing to her weekly wisdom. It’s definitely worth your time. Before her tips—and there are just two, but they are powerful—here’s what’s Ms. Azzarello believes is behind the trouble you may be having protecting your time. Most of us deal with interruptions. Whether we’re in a cube, an office, one of those dreadful open plan work environments, or working at home, we all get interrupted. All the time. Ms. Azzarrello recommends hiding. Yes, hiding. Making yourself “physically out of sight.” I am here to tell you that this simple, but not necessarily easy, tactic works, whether you work for yourself or for a company. When I need to think about how to say something or simply need to stop compulsively checking email, the best thing I can do for my clients and myself is to take a 30-minute walk. Even though I’m listening to birdsong or patting my favorite neighborhood pup, my brain is still working subliminally as my Fitbit records my steps. At the heart of her post, I believe, is the message that only you can manage your time. (“Do or don’t do,” said Yoda. “There is no try.”) And time management is important because you want to be involved in activities with great value to your company and yourself.